Missing some tropical happinness in your life? Well, your prayers have now been answered thanks to the experts at ACE Seeds. Say hello to Tropical Mix, a compilation of highly potent and highly productive tropical sativa hybrids. Boasting amazing resistant prowess and an exceptional taste/aroma, these seeds are ideal for first time growers looking to try out a long flowering specimen. Expert cultivators ACE Seeds have compiled together a stellar cast of tropical sativas for you to indulge upon. Aptly called 'Tropical Mix', it contains an amazing array of Central American sativas, Malawi genetics and Haze/Thai hybrids. Simply divine. This tantalizing mix is the perfect opportunity for intrepid growers (new and seasoned) to explore long flowering types of sativas; that don't require a lot of maintenance and are highly resistant to fungus, mildew and rain. Average-low fertilizer levels are recommended for the whole cycle. 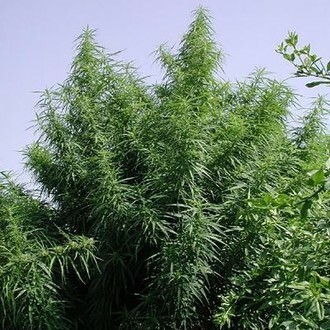 Sporting a Tropical sativa structure, Tropical Mix's stems maybe thin but are incredibly flexible, which means they able to cope with even the worst downpours or blizzards. As you may have already guessed, Tropical Mix harbors an alluring bouquet of rich smells and decadent flavors. Captivating notes of wood, spices, incense, strawberry and lemon intertwine majestically, jumping to the foreground; while a sea of other tropical fruits dance happily in the background. Truly sensational stuff! As previously mentioned these are long flowering types of seeds, so expect to wait anywhere between 12-16 weeks for them to fully flower indoors. Outdoor growers for that matter, can expect to see their efforts rewarded come November. Speaking of rewards, Tropical Mix rewards patient growers with unbelievable yields, delicious buds and gratifying highs - the type of highs that will have you grinning from ear to ear. Once fully induced, users will experience waves of happiness peppered with psychedelic periods and energetic stimulation. This is the perfect pot to share with a group of friends, for a really fun time!